Angers is a city in western France, about 300 km (190 mi) southwest of Paris, and the chef-lieu of the Maine-et-Loire department. Angers was, before the French Revolution, the capital of the province of Anjou, and inhabitants of both the city and the province are called Angevins. The commune of Angers proper, without the metropolitan area, is the third most populous in northwestern France after Nantes and Rennes and the 17th in France. 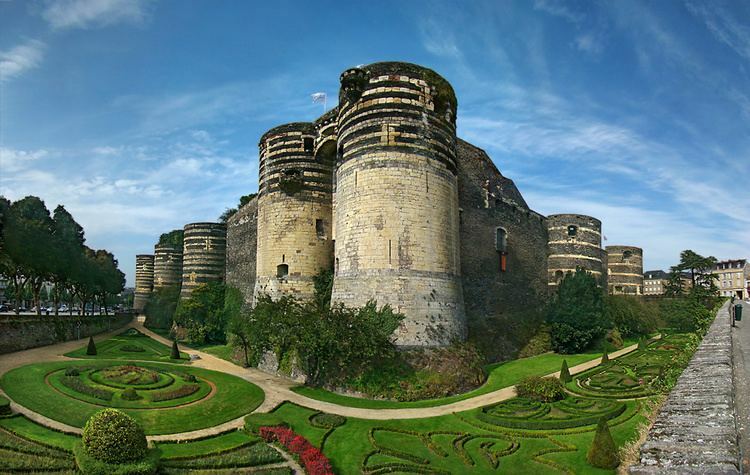 Angers is the historical capital of Anjou and was for centuries an important stronghold in northwestern France. It is the cradle of the Plantagenet dynasty and was during the reign of Rene of Anjou one of the intellectual centres of Europe. Angers developed at the confluence of three rivers, the Mayenne, the Sarthe, and the Loir, all coming from the north and flowing south to the Loire. Their confluence, just north of Angers, creates the Maine, a short but wide river that flows into the Loire several kilometers south. The Angers metropolitan area is a major economic centre in western France, particularly active in the industrial sector, horticulture, and business tourism. Angers proper covers 42.70 km² and has a population of 147,305 inhabitants, while c. 394,700 live in its metropolitan area. 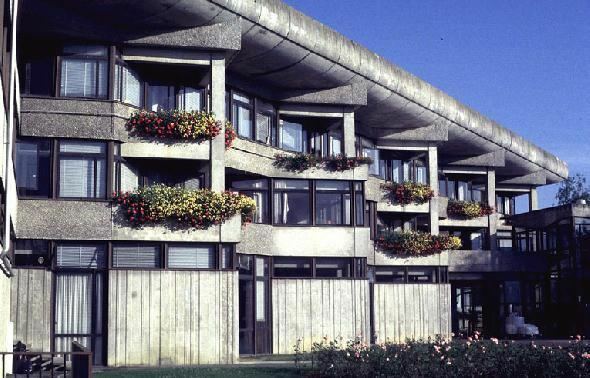 The Angers Loire Metropole intercommunality is made up of 33 communes covering 540 square kilometres (208 square miles) with 287,000 inhabitants. Angers enjoys a rich cultural life, made possible by its universities and museums. The old medieval centre is still dominated by the massive chateau of the Plantagenets, home of the Apocalypse Tapestry, the biggest medieval tapestry ensemble in the World. Angers is also both at the edge of the Val de Loire, a World Heritage Site, and the Loire-Anjou-Touraine regional natural park. Angers in located at the geographical centre of the Maine-et-Loire department, on the road which connects Paris to the Atlantic ocean. The city is situated just south of the confluence of the Loir, Mayenne and Sarthe which form together the river Maine. The Maine crosses Angers and heads south towards the Loire. The confluence of the three rivers and the proximity of the Loire make up a natural crossroads which favoured the foundation of the antique Juliomagus. 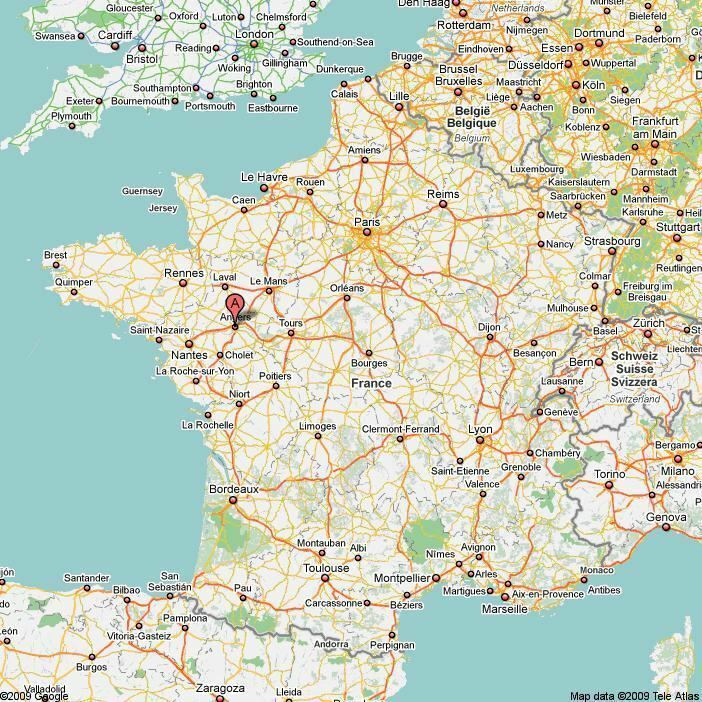 Angers is located 91 km (57 mi) from Nantes, 124 km (77 mi) from Rennes, 132 km (82 mi) from Poitiers and 297 km (185 mi) from Paris. It is also 118 km (73 mi) far from Pornic, the closest sea resort, situated on the Atlantic ocean. Elevation varies between 12 and 64 metres above sea level. Angers is in fact a hilly town, marked by a rocky promontory dominating the lower valleys of Anjou. The antique city was founded on this promontory and it is where stand today the castle, the cathedral and the medieval quarters. At the north and south, where the river Maine arrives in and leaves Angers, the landscape is formed by islands, ponds and floodplains which are a haven for birds and a typical flora of the Val de Loire. The etang Saint-Nicolas and Lac de Maine, both artificial, are among the biggest green areas of the city. Under Napoleon Is rule, Angers was one of the "Bonnes villes" and was therefore allowed to ask for a new coat of arms. The bees, symbol of the First French Empire, then replaced the royal fleurs de lys. In 1949, Angers received the 1939–1945 War Cross and since then, the decoration is sometimes placed between the two fleurs de lys. Until June 1987: Angers, la qualite. The early prosperity of the town is largely due to the nearby quarries of slate, whose abundant use for the roofs of Angers led to the citys nickname, the "Black City" (or "La ville noire", in French). As of 1911, existing industries noted in the Encyclopaedia Britannica for that year included the distillation of liqueurs from fruit (Cointreau, a brand of triple sec orange liqueur, is produced to this day in Saint-Barthelemy-dAnjou, a commune in Angers urban area); cable, rope, and thread-making; the manufacture of boots, shoes, umbrellas, and parasols; weaving of sail-cloth and fabrics; machine construction; wire-drawing; and the manufacture of sparkling wines and preserved fruits. The chief articles of commerce, besides slate and manufactured goods, were hemp, early vegetables, fruit, flowers, and live-stock. The Chateau dAngers, built on a schist promontory, dominates the river Maine and the old town. Its site has been occupied since antiquity; the castle itself was built between 1230 and 1240 by Louis IX of France. The massive walls are about one kilometer long and punctuated by 17 towers; they were built with horizontal slices of tuff and schist, giving it strength and an original striped look. During the 15th century, a chapel and the Chatelet were added in the courtyard. The Maison dAdam (Adams House), located behind the cathedral, is an excellent example of the half-timbered houses which were built during the Middle Ages. Many similar houses, although smaller, are also visible along the streets around the castle. The city also displays several Renaissance and classical hotels particuliers, the most renowned being the Logis Pince from the 16th century. The Maison bleue (Blue House), built in 1927, is an Art Deco masterpiece. The former seat of the Compagnie francaise dAviation was built in 1938 and abandoned during the Second World War. Totally refurbished in 2004, it is now a testimony to 1930s architecture. The Saint-Maurice cathedral is a major landmark in the cityscape, with its two spires culminating at 75 meters. The construction of the current building started during the 12th century on the remains of an older sanctuary. The original structure, romanesque, received gothic columns and vaults in the middle of the 12th century, giving birth to the Angevin gothic, a style that quickly spread in Western France and the Angevin possessions in Italy. Sculptures and architectural details were added to the facade during the 16th century. The twin spires were built in 1518 and 1523. The neighbouring Palais du Tau, the former episcopal palace, dates from the 12th century. The skyline is also marked by the Tour Saint-Aubin. Completed in 1170, it was the bell-tower of an abbey closed during the French Revolution and destroyed in 1810. Elaborately sculptured 11th and 12th century arcades also survive in the courtyard of the Prefecture. Another abbey, the Abbaye Toussaint, founded during the 13th century, was also partially pulled down and only the church and parts of the cloister are still visible. On the southern limits of the commune, close to the Maine, stands the Couvent de la Baumette, founded during the 15th century by Rene of Anjou. La Doutre, an old quarter located on the western bank of the Maine and facing the castle, contains two major medieval sites, the former Abbaye du Ronceray, built during the 11th and 12th century, and the Hopital Saint-Jean, founded by Henry II of England and used as the city hospital until 1870. The Musee des Beaux-Arts dAngers, located in the Renaissance Logis Barrault, displays a collection of paintings and sculptures dating from the 14th century to today. It is particularly renowned for its 18th-century paintings, including works by Jean-Baptiste Greuze, Van Loo, Antoine Watteau, Jean-Honore Fragonard and Jean Simeon Chardin. The museum also contains a graphic design studio, a gallery devoted to the history of Angers and a temporary exhibition gallery. The institution has an antenna at the chateau in Villeveque, a village located several kilometers north of the city. Inside the castle, a special gallery displays the Apocalypse Tapestry, ordered by Louis I of Naples at the end of the 14th century. It is more than 140 meters long, and thus, the biggest medieval tapestry in the world. Inspired by manuscript miniatures, the successive scenes, designed by Jean Bondol, illustrate the Apocalypse of St John. Located inside the old Hopital Saint-Jean, the Musee Jean-Lurcat et de la tapisserie contemporaine displays tapestries dating from the 19th and 20th centuries. The museum is dedicated to Jean Lurcat, an artist noted for his role in the revival of contemporary tapestry, and notably exhibits his "Chant du Monde", a modern echo to the Apocalypse Tapestry made after the bombing of Hiroshima. The Museum dhistoire naturelle d’Angers has been located in the 1521 Hotel Demarie-Valentin since 1885. It exhibits a large collection of mounted animals and fossils, divided in three departments, one for zoology, one for botany and the last one for paleontology and geology. The Logis Pince, constructed during the Renaissance, is the home of the museum of the same name. It displays Egyptian, Greek, Roman and Etruscan antiquities as well as Chinese and Japanese artifacts. Located in the Abbaye Toussaint, the Galerie David dAngers gathers sculptures, reliefs, medallions by David dAngers, a 19th-century sculptor born in the city. The gallery owns as well the preparatory works for the Pantheon of Paris pediment. Angers also enjoys a Maison de lArchitecture, which organises various exhibitions and workshops, as well as several temporary exhibition galleries distributed in the city centre. Outside the commune limits are also an aviation museum and a museum of communications.